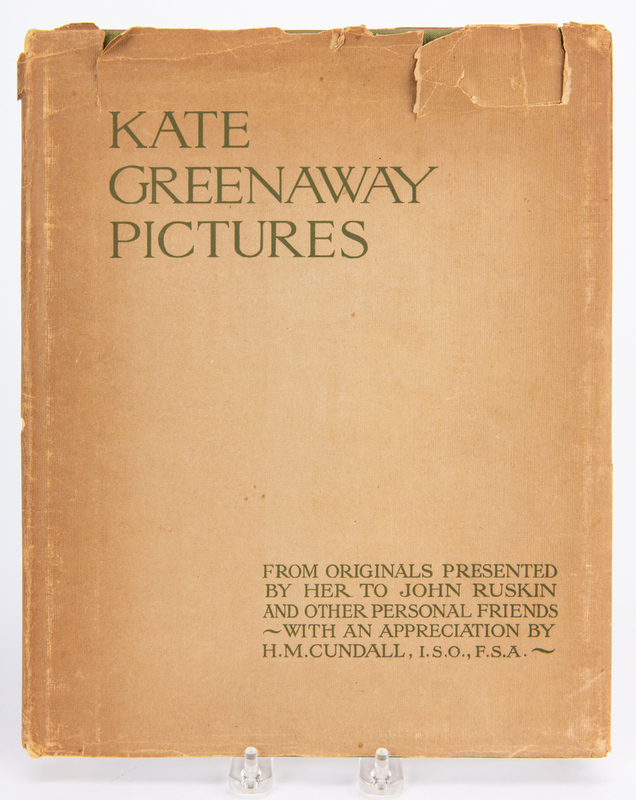 Four (4) Kate Greenaway books and works on paper. 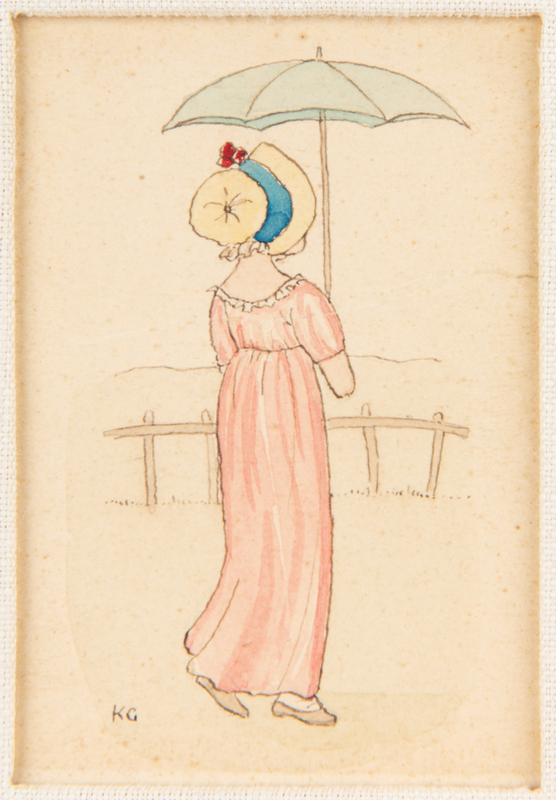 1st item: Kate Greenaway (United Kingdom, 1846-1901) watercolor on paper painting depicting a woman in a pink dress and a bonnet holding a green parasol in a country setting. Signed "KG" lower left. 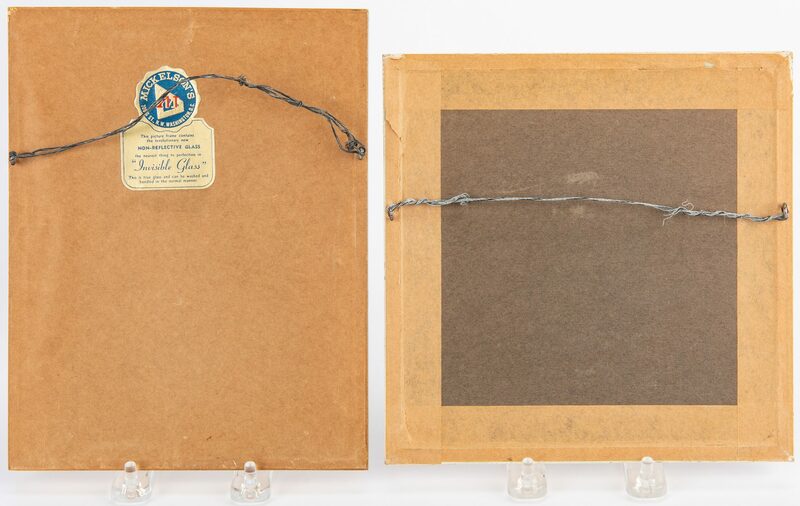 Mickelson's, Washington, D.C. gallery label with non-reflective "Invisible Glass" label, en verso. Matted and housed under glass in a gilt wood frame with bead course running pattern. 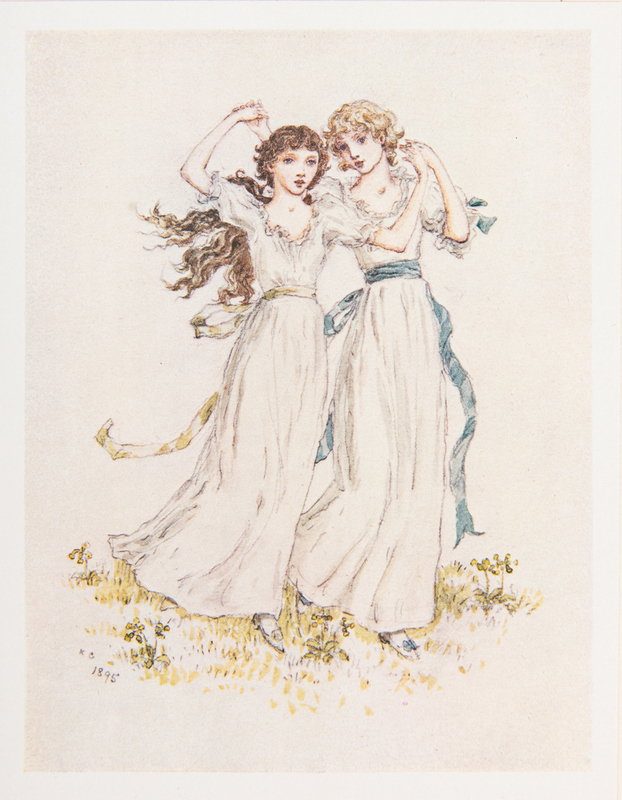 Sight – 3 1/4" H x 2 1/4" W. Framed – 8 3/4" H x 6 7/8" W. 2nd item: Kate Greenaway Pictures From Originals Presented by Her to John Ruskin and Other Personal Friends (hitherto unpublished), First Edition, with an appreciation by H.M. Cundall, I.S.O., F.S.A., 1921. Published by Frederick Warne and Company, Ltd., London, New York. Quarto, 11 pages of text, lithographic frontispiece, and 20 chromolithographic illustration plates mounted to white paper with lettered tissue paper guards, hardbound in one quarter yellow cloth with green cloth and gilt and black lettering to covers and black lettering to spine, green marbled end papers, includes dust jacket. 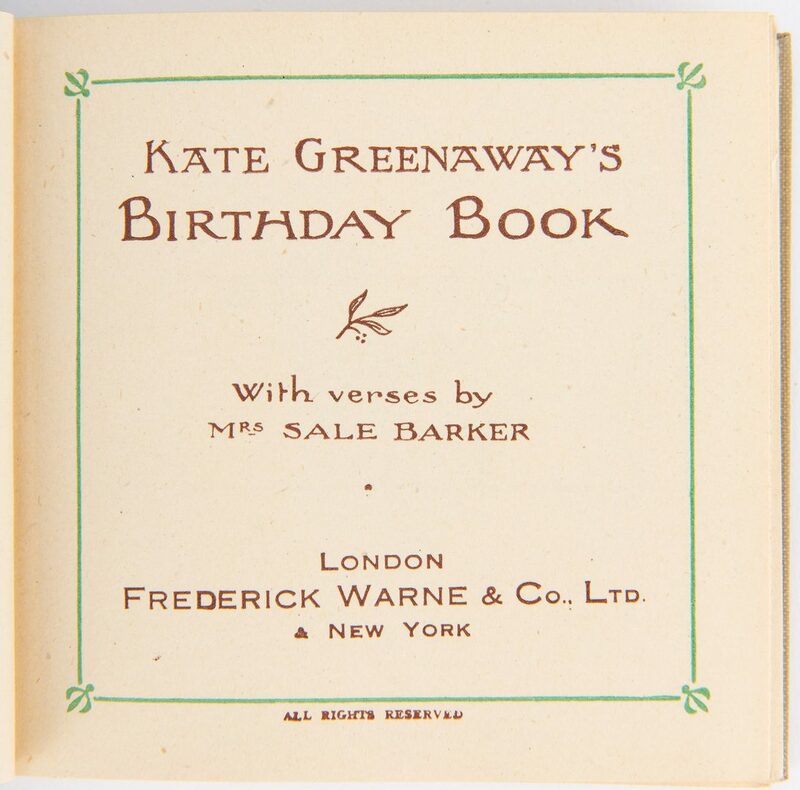 12 1/2" H x 10 1/8" W x 3/4" D. 3rd item: Kate Greenaway's Birthday Book, with verses by Mrs. Sale Barker, circa 1918. 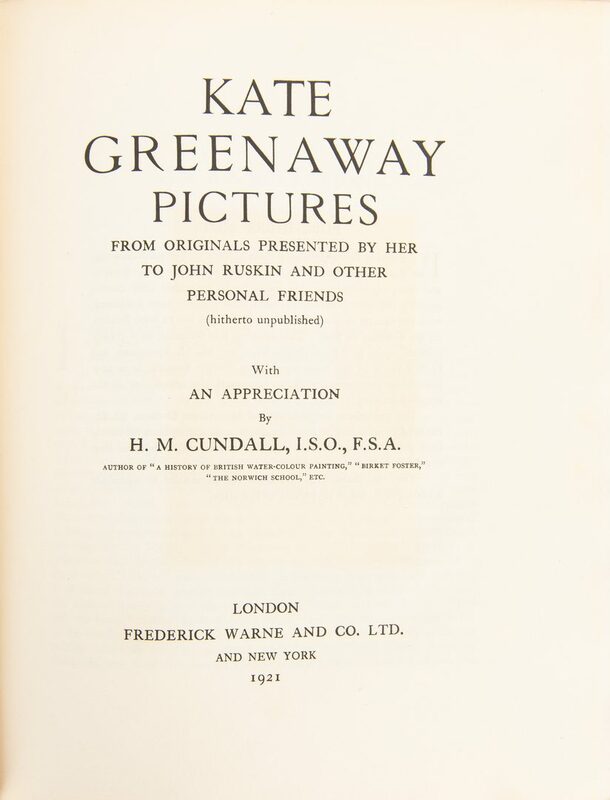 Published by Frederick Warne and Company, London, New York. 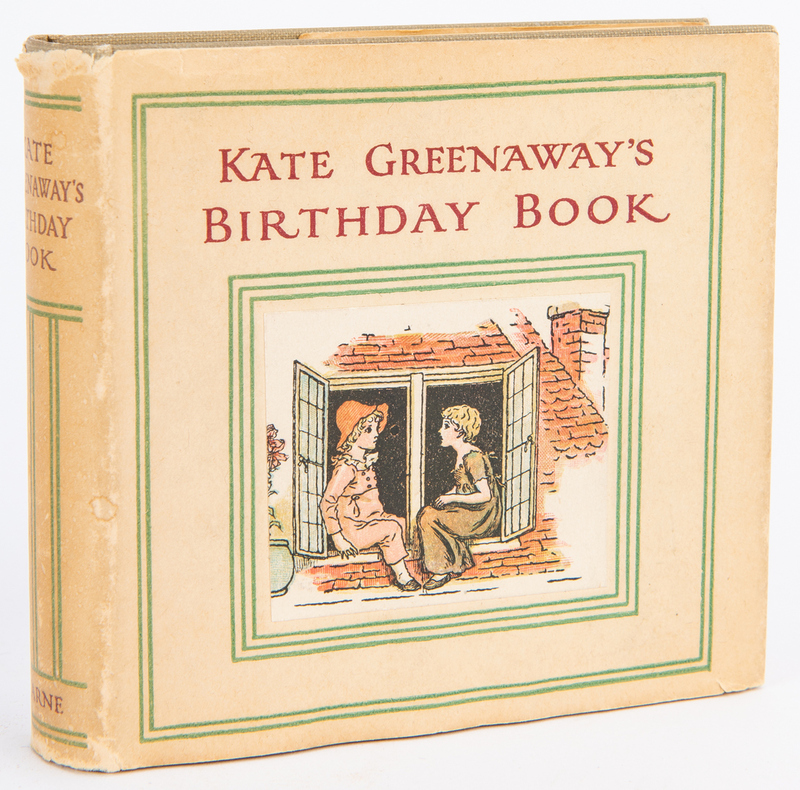 132 pages with 12 full page chromolithographic illustrations, additional lithographic illustrations, and lined note paper, hardbound in grey cloth with green borders and red lettering to covers and spine, includes dust jacket. 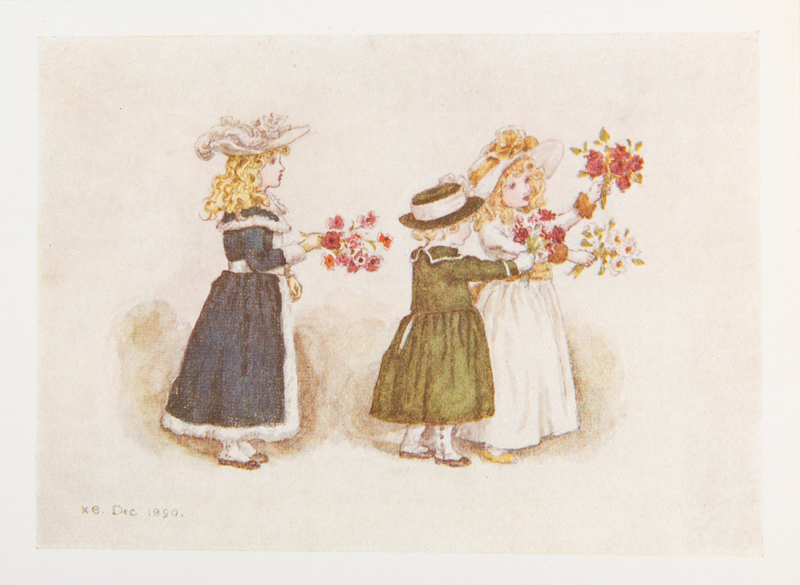 4" H x 4 1/2" W x 7/8" D. 4th item: Framed four (4) Kate Greenaway chromolithographic "Reward of Merit" cards, circa 1887. 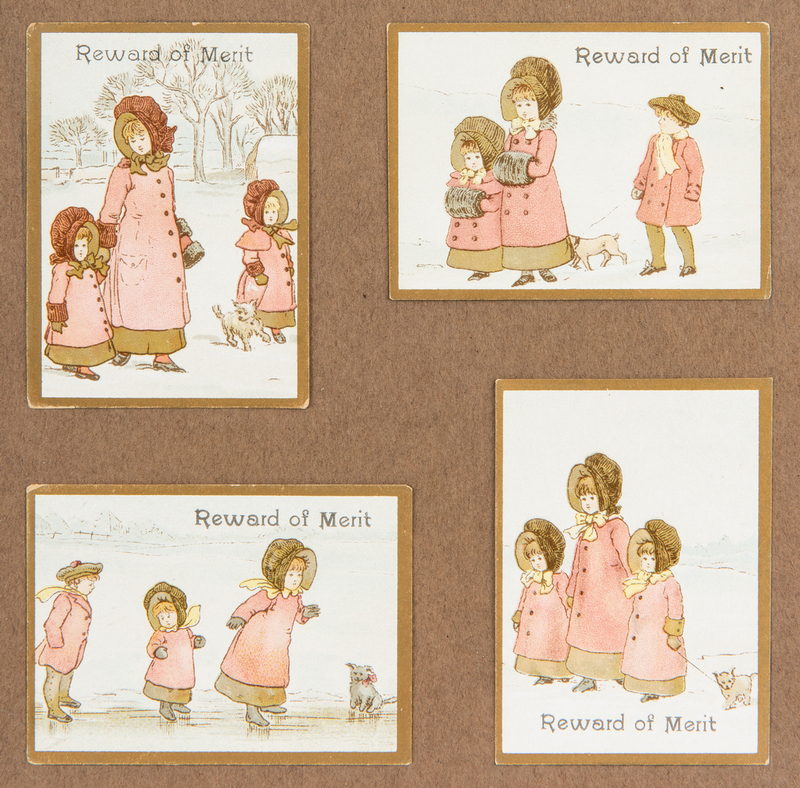 The card depicts winter scenes of children and a small dog, each reading "Reward of Merit" with gilt border. 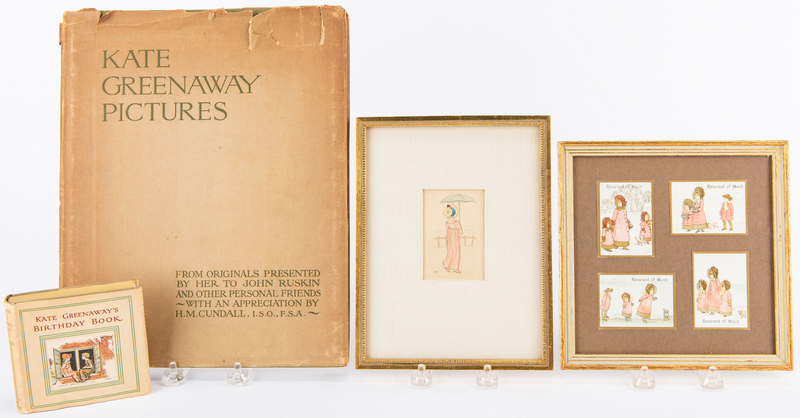 Cards mounted to brown card stock and housed under glass in a gilt wood frame. 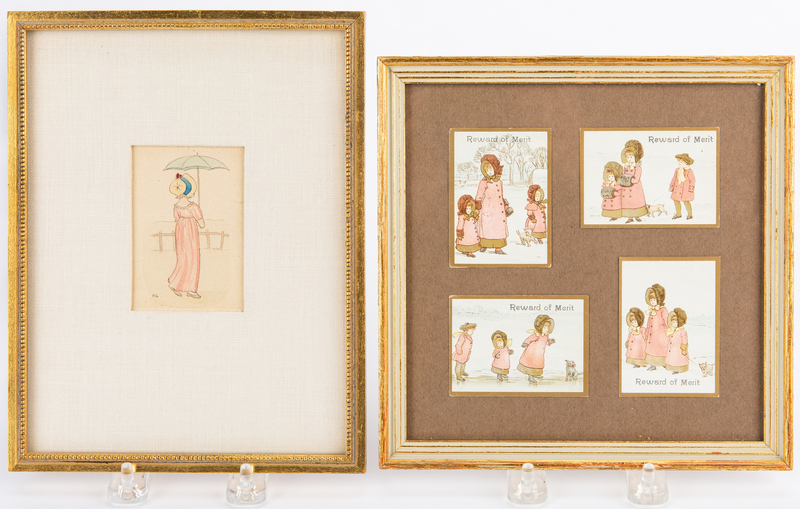 Cards approximately 2 3/4" H x 2" W. Sight – 6 3/4" H x 6 3/4" W. Framed – 7 7/8" H x 7 7/8" W. CONDITION: 1st item: Overall good condition with minute foxing spots, 2 1/4" crease along width of painting at center. Not examined outside of frame. 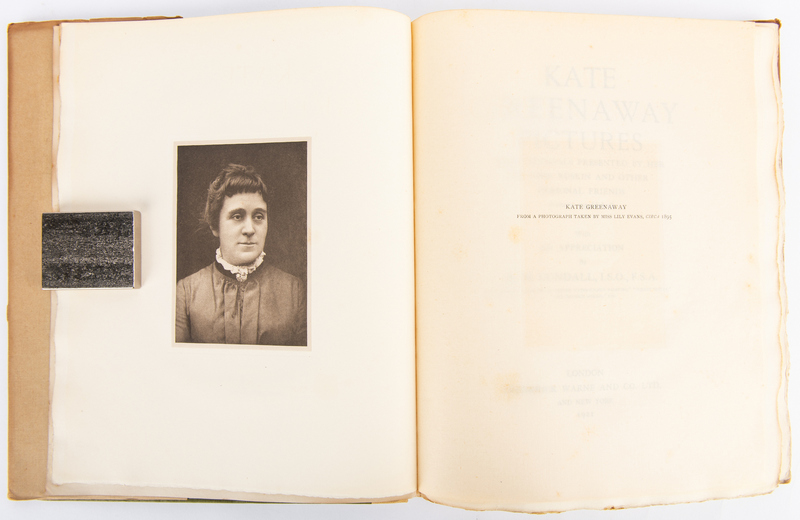 2nd item: Dust jacket with tears, areas of loss, toning, acid burning. Covers with shelf wear, scuffs, corners bumped. 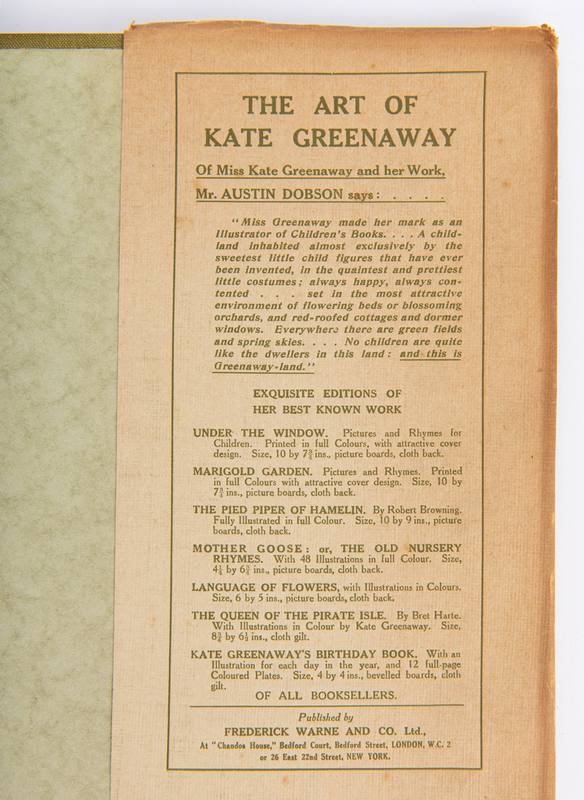 Pages in overall good condition with foxing spots, toning. Plates are collated. 3rd item: Dust jacket with minute tears, wear, acid burn, minute areas of dampstaining. 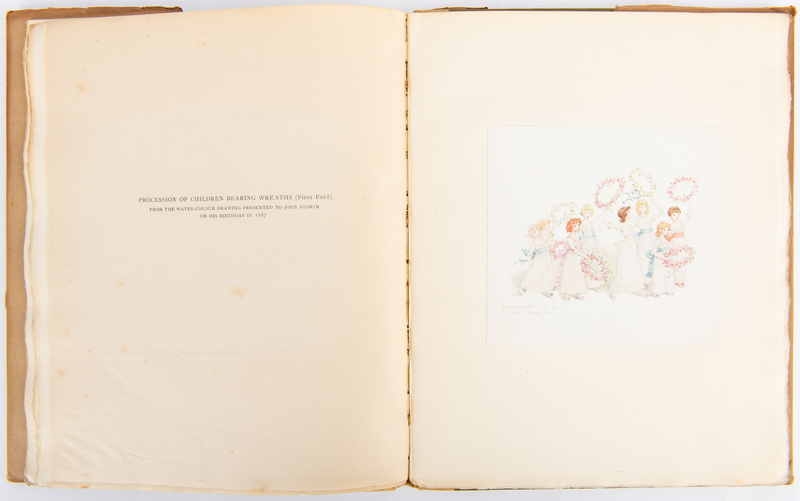 Covers and pages in overall very good condition. 4th item: Cards with wear to edges, otherwise good condition. Not examined outside of frame.